"Very quick and easy recipe! Delicious with vanilla ice cream!" Place apples in a 9x13 inch baking dish. 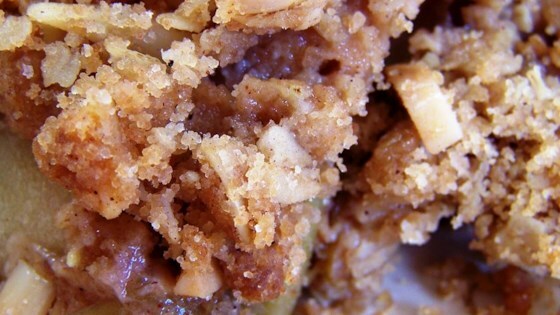 In a bowl, mix melted butter, flour, sugar, oats, and 1 tablespoon cinnamon to form a crumbly mixture. Sprinkle over apples. Dot with remaining 1/4 cup butter, and sprinkle with remaining 1 tablespoon cinnamon. Bake 50 minutes in the preheated oven, until lightly browned and apples are tender. Easy and very yummy! I replaced some white sugar with brown sugar. Apples were a little mushier than I like so next time I will probably only bake for 40-45 minutes.